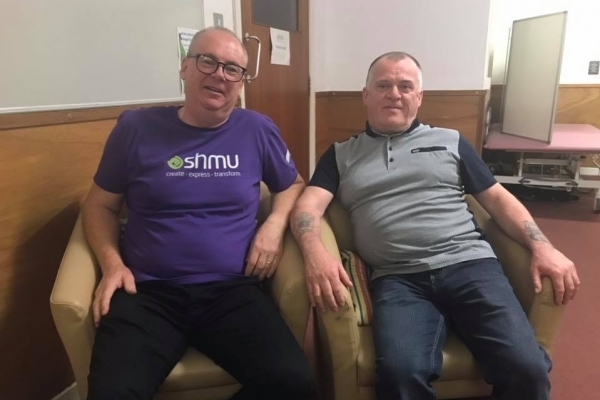 The shmuCREW would like to say a massive thank you to two of our FM volunteers, Eddie McDonald and Acky Buchan for holding a fundraising evening for us last weekend. The pair raised £600 with a little help from their friends by putting on a soul night here at shmu's temporary home in Rosehill House. We would also like to thank the guest DJs who have featured on Eddie and Acky's Friday Night Whole Lotta Soul show before: Allan Harding from Crewe Iain McCabe and Matty Brown from Dundee Paul Quinn Banchory Barry Huyton Tony Bruce from Inverurie and the rest from Aberdeen Alan Dey, Allan Sadler,Ian McHattie,Shaun Teirney,Tony Grieg and Richie Conn plus both myself and Acky. Eddie said: "When we moved into Rosehill and I saw the size of the old canteen I always thought of doing an event to raise funds so when I saw how successful the BYOB bingo night was and the push to raise funds I thought it was the right time to put something back into shmu and allow the listeners and anyone else who wants to, to come in and see what the soul music scene is all about. "There is many people behind the scenes that helped get this event going from the staff and volunteers at shmu, to family and friends so a big thanks from me and Acku. I would also like to thank SHMU for believing in me all those years ago and allowing the show to get aired." We're so grateful to our volunteers who have helped us in our fundraising efforts to kit out the Woodside building and this event has pushed us over the £8k mark in our community fundraising. You can catch Eddie and Acky every Friday night on shmu 99.8FM or online between 8 and 10pm. We want to hear from you! Whether you have news, views or are keen to be involved in shmuFM. Young people are at the heart of what do. Get involved with our youth projects.